Dagbani (Dagbane), also known as Dagbanli and Dagbanle, is a Gur language spoken in Ghana which is closely related to and mutually intelligible with the Mampelle and Nanumba languages which are also spoken in Northern Region, Ghana. Dagbani is also similar to the other languages of the same subgroup spoken in this Region, Dagaare and Waala languages, spoken in Upper West Region of Ghana, and the Frafra language, spoken in Upper East Region of Ghana. Its native speakers are estimated around 830,000 (2000). Dagbani is also widely known as a second language in Northern Ghana especially among acephalous tribes overseen by Ya-Na. 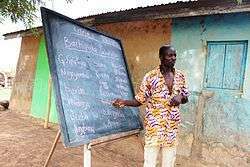 It is a compulsory subject in Primary and Junior High School in the Dagbon Kingdom, which covers the eastern part of the region. Dagbani has a major dialect split between Eastern Dagbani, centred on the traditional capital town of Yendi, and Western Dagbani centred on the Administrative capital of the Northern Region, Tamale. The dialects are however mutually intelligible and mainly consist of different root vowels in some lexemes, and different forms or pronunciations of some nouns, particularly those referring to local flora. The forms Dagbani and Dagbanli given above for the name of the language are respectively the Eastern and Western dialect forms of the name, but the Dagbani Orthography Committee resolved that “It was decided that in the spelling system <Dagbani> is used to refer to the ... Language, and <Dagbanli> ... to the life and culture”: in the spoken language each dialect used its form of the name for both functions. Olawsky (1999) has the schwa in place of /ɨ/, unlike other researchers on the language who use the more articulatorily higher /ɨ/. Allophonic variation based on tongue-root advancement is well attested for 4 of these vowels: [i] ~ [ɪ], [e] ~ [ɛ], [u] ~ [ʊ] and [o] ~ [ɔ]. Dagbani is a tonal language in which pitch is used to distinguish words, as in gballi [ɡbálːɪ́] (High-High) 'grave' vs. gballi [ɡbálːɪ̀] (High-Low) 'zana mat'. The tone system of Dagbani is characterized by two level tones and downstep (a lowering effect occurring between sequences of the same phonemic tone). Dagbani is written in a Latin alphabet, but the literacy rate used to be only 2–3%. This percentage is expected to rise as Dagbani is now a compulsory subject in primary and junior secondary school all over Dagbon. The orthography currently used (Orthography Committee /d(1998)) represents a number of allophonic distinctions; tone is not marked. Dagbani is agglutinative, but with some fusion of affixes. The constituent order in Dagbani sentences is usually agent–verb–object. There is an insight into a historical stage of the language in the papers of Rudolf Fisch reflecting data collected during his missionary work in the German Togoland colony in the last quarter of the nineteenth century, especially the lexical list, though there is also some grammatical information and sample texts. A more-modern glossary was published in 1934 by a southern Ghanaian officer of the colonial government, E. Foster Tamakloe in 1934, with a revised edition by British officer Harold Blair. Various editors added to the wordlist and a more-complete publication was produced in 2003 by a Dagomba scholar, Ibrahim Mahama. According to the linguist Salifu Nantogma Alhassan, there is evidence to suggest that there are gender-related double-standards in the Dagbani language with "more labels that trivialise females than males." Meanwhile, the data was electronically compiled by John Miller Chernoff and Roger Blench (whose version is published online, and converted to a database by Tony Naden, on the basis of which a full-featured dictionary is on-going, and can be viewed online. ↑ Hammarström, Harald; Forkel, Robert; Haspelmath, Martin; Bank, Sebastian, eds. (2016). "Dagbani". Glottolog 2.7. Jena: Max Planck Institute for the Science of Human History. ↑ Naden, Tony (1989). Gur. Lanham, MD: University Press of America. pp. 141–168. ↑ Bendor-Samuel, John T. [ed.] (1989). The Niger-Congo Languages. Lanham, MD: University Press of America. ↑ Fisch, Rudolf (1912). "Grammatik der Dagomba-Sprache". Archiv für das Studium deutscher Kolonialsprachen. 14: 1–79. ↑ Tamakloe, E.Foster [ed.] (1934). Dagomba Dictionary and Grammar. Accra: Government Printer. ↑ Tamakloe, Emmanuel F. (1940). H.A.Blair, ed. Dagomba (Dagbane) Dictionary. Accra: Government Printer. ↑ Mahama, Ibrahim (2003). Dagbani-English Dictionary. Tamale, N/R: School for Life. ↑ "About the author: Salifu Nantogma Alhassan". Equinox. Retrieved 27 February 2015. ↑ Alhassan, Salifu Nantogma (October 2014). "Sexism and gender stereotyping in the Dagbanli language". Gender and Language. Equinox. 8 (3): 393–415. doi:10.1558/genl.v8i3.393. ↑ "Dagbani Dictionary progress" (PDF). Olawsky, Knut J. (1999). Aspects of Dagbani grammar, with special emphasis on phonology and morphology. München: LINCOM Europa. Olawsky, Knut J. (2003). "What is a word in Dagbani?". In R. M. W. Dixon and Alexandra Y. Aikhenvald. Word: A Cross-Linguistic Typology. Cambridge: Cambridge University Press. pp. 205–226.